A Perth Concert Hall gift voucher is the perfect gift for all music lovers in your life! 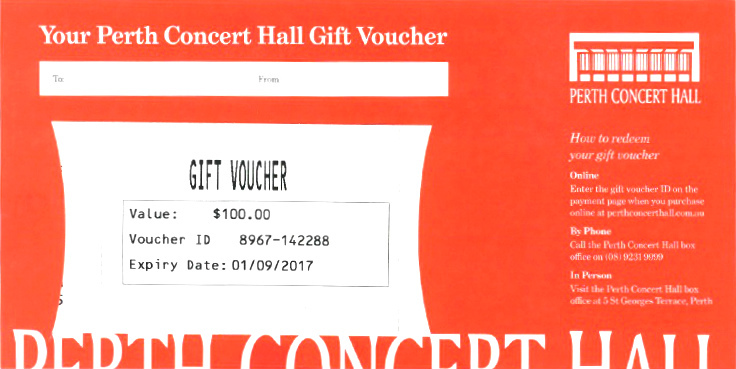 Perth Concert Hall gift vouchers are redeemable for all concerts on sale through the Perth Concert Hall box office and Perth Concert Hall website. When redeeming gift vouchers, normal transaction fees apply. Gift vouchers are valid for 12 months from the date of purchase. Your gift voucher(s) will be sent to you at your nominated address but you may request for the voucher(s) to be sent as a gift to an alternate address by clicking the box below and completing the relevant details. Only one alternate address can be used per order. If this is required, we will process your request as per the details entered below instead of the shipping details selected during the checkout.